Blessed with attentive and pleasant staff, the restaurant offers great hospitality to both locals and travelers. This clean, quiet restaurant offers fresh, delicious foods, all of which are presented very well. You can enjoy your favorite dish. Given its delicacy, the visitors do not complain about the price of the foods. Since it is located near the main road, it is very easy to find this restaurant. 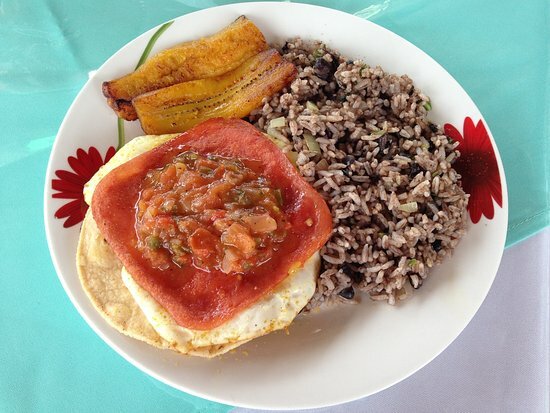 The menu offers Casado, steak, fish, papaya juice, guanabana juice, and much more. Aside from the dishes and juices, you can, of course, order a cold beer. If it is your liking, you can start to whet your appetite with papaya juice, which is very tasty. Then, you can order your steak. While you can order any food you like, do not forget to ask for Casado; it is well cooked and served in large portions to satisfy your hunger. If you are no longer hungry or you cannot finish this dish, you can share it with a friend. Both of you will love it. Just as you started with fresh juice, you can finish off with another. This time you can order the guanabana juice. Though it is thick, the texture is amazing. After your lunch or dinner, you can hang out with friends and visit Nature Pavillon. If you are looking for a traditional restaurant that offers both Costa Rican and Mexican foods, Soda El Kora is the right place for you. Though it is a small and unpopular restaurant, it gives you these two choices: you will get to choose whether you want to order from the Mexican menu or the Costa Rican one. It is so easy to get there; when you are at Tiribina reserve, it is just a stone’s throw away. Both Costa Rican and Mexican menu are extensive. The Mexican food comprises of taco de pescado, Enchiladas, ensalada chicken, Burro, Huarache, Quesadillas as well as Batidos, giving you great experience. You can also have burgers, which are so tasty that will have you asking for some more despite the big portion you receive. If you like sopa Azteca, you can have at it. You can also order burritos. For lunch, you can order fish tacos. If you don’t want fish, there is delicious soup; you could also consider quesadillas. You will love the food. It is cooked by the owner, who values your satisfaction. He prepares the food with passion, ensuring that you return any time soon. You will also be surprised that the restaurant is visited even by the locales, which means they have always loved the experience here. You can also order ice creams; you can choose between coffee and tea.